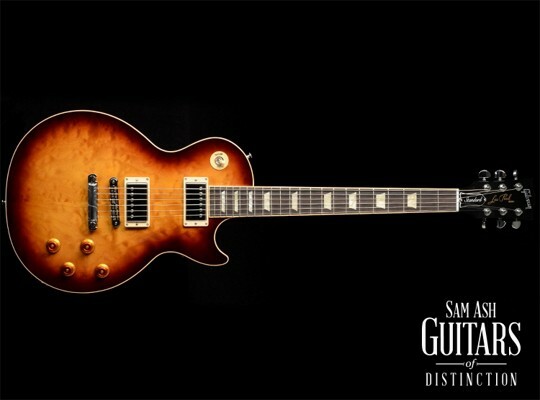 Since it’s introduction in 1958, the Les Paul Standard has always been the heart and soul of the Gibson USA lineup and today, the Les Paul Standard continues to preserve it’s acclaimed role as the core of the 2013 Year of Les Paul celebration with the 2013 Les Paul Standard Premium. The Les Paul Standard Premium offers incredible versatility, more so than any of its predecessors, exemplifying Les Paul’s vision of both elegance and innovation, and is a faithful respresentation of the union between modern flexibility and playability fused with timeless tone. The pro business of this 2013 Les Paul Standard premium is crafted from the highest quality tonewoods, visually and tonally appealing AAA birdseye maple for the top and paired with weight relieved mahogany for the back– the classic ingredients for the esteemed Gibson-fueled tone that’s unmistakably ‘Les Paul’. Gibson’s integrates their modern weight relief pattern into the design of these Les Paul Standards. Their modern weight relief is the happy medium in between chambered and traditional weight relief, providing you with optimal resonance (not too much, not too little) with enhanced sustainability, depth, richness, clarity and punch and a slight reduction in the weight for increased player comfort. 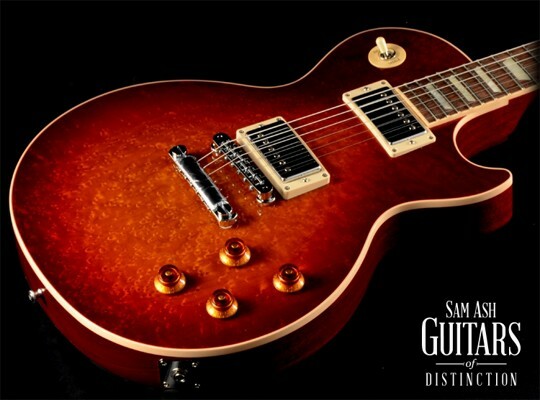 The body is adorned in a stunning high gloss nitrocellulose lacquer Heritage Cherry Sunburst finish that accentuates the woods beautiful figure patterns and caters to the Les Paul Standard’s enticing appeal. The neck is carved from solid, quarter-sawn mahogany into an asymmetrical version of the coveted ’60s neck profile, making this one of the most comfortable and appealing necks Gibson has ever produced. The compound radius, bound rosewood fingerboard facilitates outstanding playibility across its entirety, with a flatter radius higher up on the fingerboard, ideal for leads and a rounder radius towards the bottom of the fingerboard, perfect for open chording and rhythm guitar. Under the hood of these 2013 Les Paul Standard Premium’s are a set of upgraded BurstBucker Pro pickups, a #2 in the bridge and a #1 in the neck. Although these pickups are based off of the blueprint for late ’50s PAF humbuckers, Gibson now takes that, and integrates potted coils for low-noise performances even at the highest volumes and utilizes innovative four-conductor wiring for increased sonic versitility. Each pickup is wired to its own independent volume pot and features coil-tapping capabilities, allowing you to split the coils for that single coil tone, while the middle position will facilitate a hum-canceling performance thanks to the reverse-wound/reverse-polarity bridge pickup. The independent tone controls also feature push/pull pots and will further broaden your tonal horizons. For reverse-phase tones just simply pull up tone control for the neck pickup or pop the bridge pickup’s tone control up to tap into Gibson’s innovative Pure Bypass setting, which routes that pickup straight through the output jack and into your amplifier, bypassing the volume and tone controls resulting in superb tonal clarity and scorching hot tones, perfect as an “instant lead” preset. To provide this guitar with the ultimate sustainability, precise intonation and incredible tuning stability, this 2013 Les Paul Standard features a locking TonePros Tune-O-Matic bridge perfectly matched with high quality business a stopbar tailpiece and a set of the high-quality locking Grover kidney-button tuners. To pay homage to the original, the 2013 Les Paul Standard also employs classic specs including a 24.75” scale length as well as a 1 11/16” corian nut. Other traditional appointments classic trapezoid fingerboard inlays, cream binding, pickup rings and pickguard, amber top-hat knobs and a traditional black and white truss rod cover bell. The 2013 Les Paul Standard Premium comes fully protected inside of a plush-lined Gibson hardshell case and includes a set of strings, picks and a Gibson keychain.